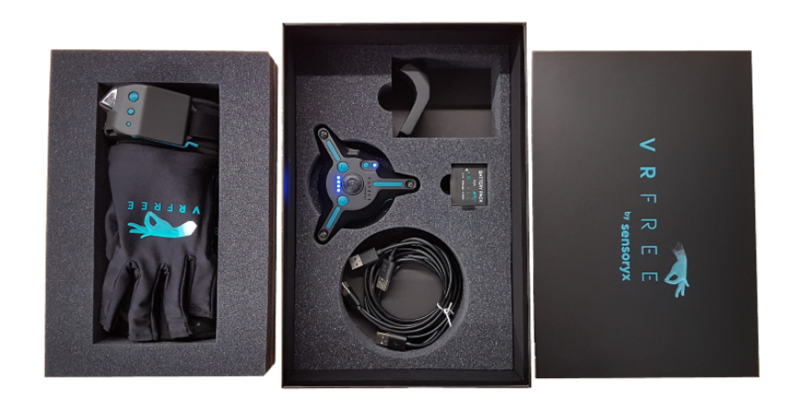 Last week Sensoryx successfully shipped its first 150 VRfree® glove systems to In-diegogo backers worldwide – 6 months after the official crowdfunding had ended. The VRfree® kit comprises a pair of VR gloves with wristmodules, a headpiece for the HMD, rechargeable batteries, connection cables and a software development kit for Unity and Unreal including libraries for Windows 10 (x64) and Android. The system can be bought via In-demand on Indiegogo for $390. VRfree® is the world’s first mo-bile VR glove system with integrated 3D hand- and finger tracking, offering full degrees of freedom and beyond field-of-view usage. The system is compatible with existing OpenVR applications and forward compatible with “Full-finger”-dexterity applications developed for next-generation ‘controllers’. With the VRfree® system validated as a series-ready product, the Sensoryx team is moving forward with its next hardware project that will be presented at a major con-ference before year-end. It will expand and scale its mobile glove/headmount system. VRfree® is the world’s first mobile VR glove system with integrated 3D hand- and finger tracking, offering full degrees of freedom, millimeter precision and compatibility with all major HMDs – stationary and mobile ones. The system allows players to use their hands intuitively and in realtime in VR, making the use of controllers obsolete. Sensoryx is a Swiss electronics startup that develops novel motion capture hardware. Its goal is to become the market leader of intuitive interaction systems for VR and AR.